Couples planning a fall wedding won't want to miss these stunning seasonal ideas. Fall is quickly becoming the most popular time of year to get married. If you're in the process of choosing your wedding date, these fall wedding ideas might just convince you that fall is the perfect season for you. 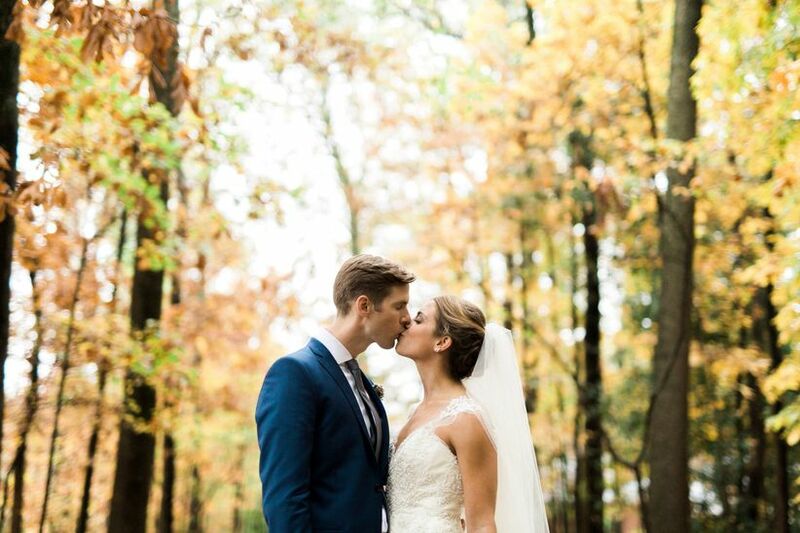 While we love spring, summer and winter weddings, there's something special about fall as a season in general. Maybe it's the thought of cozy fireside nights, leaves crunching under our feet, and pumpkin spice everything for three months straight, but we would have to argue that fall is a pretty magical time of year. If you love autumn as much as we do and are dreaming of a fall wedding, check out these seasonal ideas. Most venue types are suitable for fall weddings, but outdoor venues can be especially beautiful. If you're getting married in a region where the leaves change color in the fall, look for venues with scenic views and lots of foliage. With outdoor venues, you'll need to consider the weather—rain, cold temperatures, hurricanes, and even snow could be a factor depending on your wedding location. Consider renting space heaters and enclosed tents to keep your guests toasty and dry at an outdoor fall wedding. Always have an inclement weather wedding plan if you're getting married outdoors, or opt for an indoor venue altogether if the thought of bad weather stresses you out too much. Wineries and barns are great venue types for fall weddings and are often located in beautiful spots. 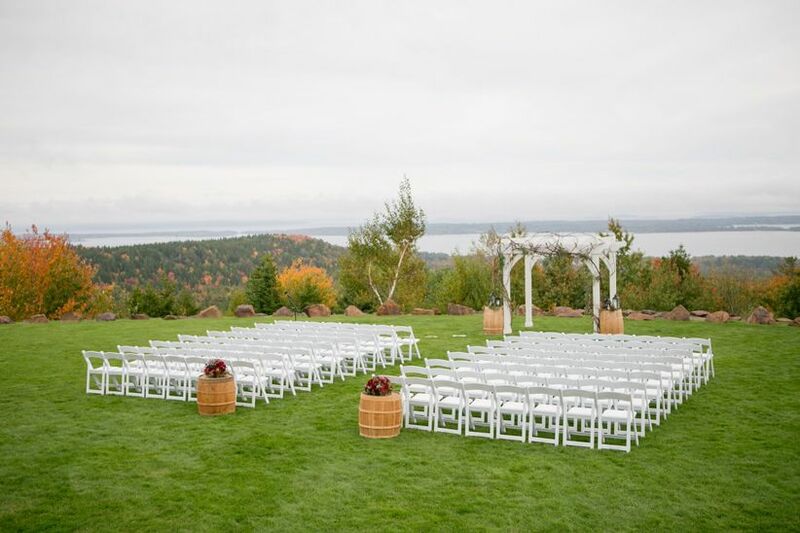 Fall weddings range from anytime in mid-September to late November. 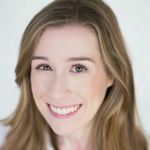 On the East Coast, the Atlantic hurricane season runs from June 1 through November 30, which could impact your big day (like this couple's wedding during Hurricane Joaquin) if the venue is in the path of a storm. 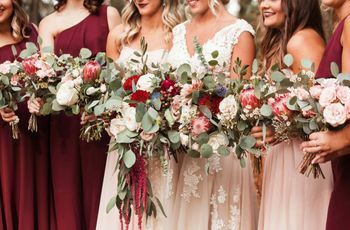 The great thing about fall wedding ideas is that they're an opportunity to play around with darker, richer hues that wouldn't necessarily be ideal for spring or summer weddings. 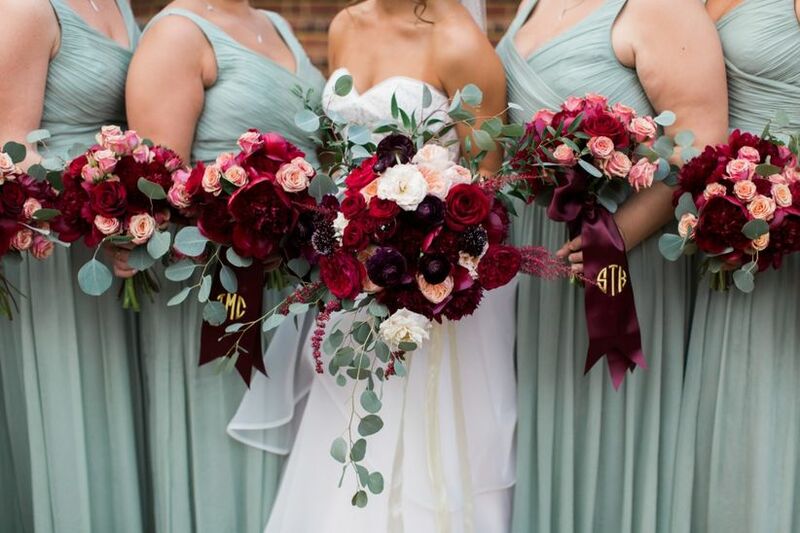 Jewel tones look beautiful during the fall months–plum, peacock blue, marsala/burgundy, navy, emerald green, and mauve are just a few options we love. 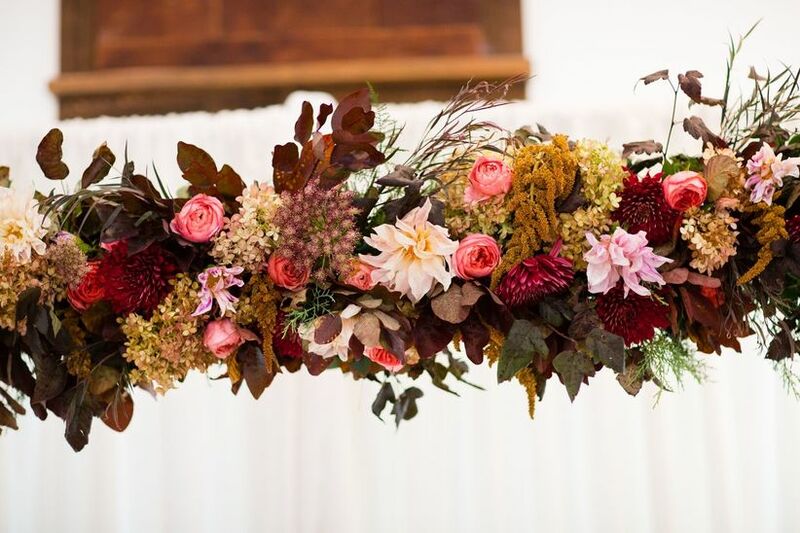 Think about the colors that you naturally see during the fall months and build your color palette around those hues for an impeccably stylish wedding. Metallic gold pairs especially well with darker tones as an accent color. You can also stick to a more traditional fall color palette, such as orange, yellow, red, and brown. These warmer tones are great for rustic or barn weddings, or if you want to create a quintessential autumnal vibe. Fall is the perfect time to play up seasonal elements. Pumpkins, wheat stalks, gourds, hay bales, dried leaves, and maize or corn bundles are all popular options. 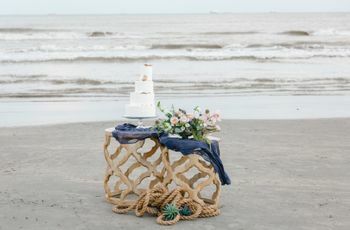 These details will bring a rustic theme to your decor, and they're best suited for outdoor/casual venues, such as barns and gardens, versus formal ballrooms and banquet halls. If you're planning to incorporate seasonal accents into your decor, don't go overboard—you don't want your reception space to look like the Halloween aisle at your local party store. Stop and think twice before stocking up on those plastic Jack-O-Lanterns! There's nothing wrong with having the ultimate fall or Halloween-themed wedding, but the trick to doing it in a tasteful way is to choose your accent pieces carefully and pair them with non-themed ideas to balance everything out. 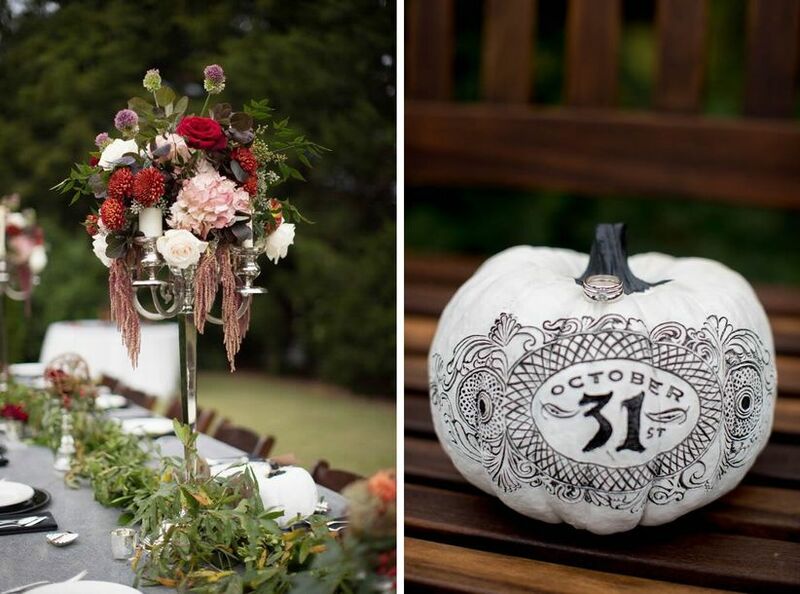 Check out this wedding and this wedding for fall wedding ideas that are themed yet classy. If you don't want to see a single trace of orange or yellow at your fall wedding, that's okay too. Jewel tones are a glamorous and elegant alternative. Add oomph to a glam-themed wedding with luxe details, like rose gold decor, copper, velvet, and sequins. A neutral color palette, such as ivory and gray, will create a welcoming and cozy setting. Pair neutral colors with natural elements, like driftwood, fresh greenery, faux fur, and pinecones for a woodland wedding theme. Lastly, fall weddings are a great time to experiment with unique lighting options, especially after daylight savings time ends in November. Take advantage of darkness falling earlier in the day by using candles, bistro lights, luminaries, lanterns, or marquee letters to set the mood. 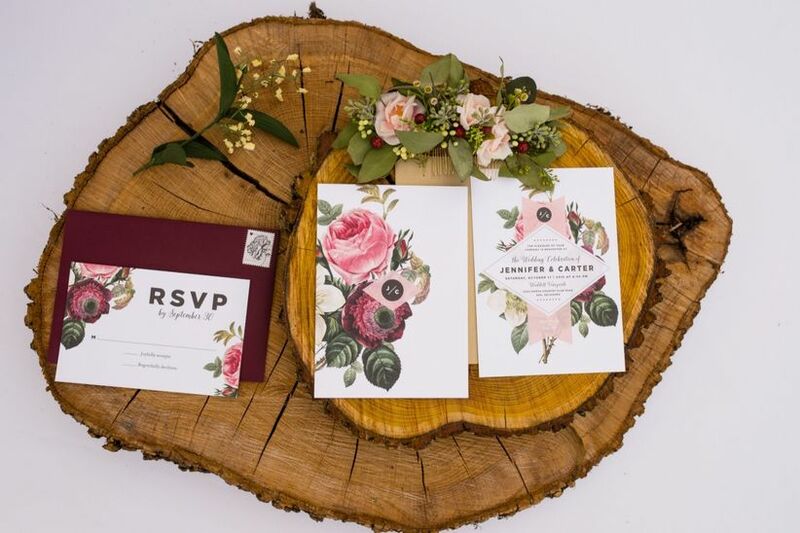 Foliage motifs and faux bois backgrounds are among the most popular designs for fall wedding invitations. These options tend to be rustic and outdoors-y, so if they don't match your style, don't be shy about straying away from the traditional fall look. If your wedding isn't rustic, you can personalize your invitation suite with calligraphy, monograms, and trendier details like watercolor washes, metallic foil (take a look at this rose gold design), and laser cutouts. Floral patterns are another beautiful option if you want to avoid a themed design (read: no pumpkins or leaves). The flowers at your fall wedding should mirror the earthy and romantic undertones of the season. Choosing blooms that are available in warmer colors (dark pink, marsala, purple, orange, green, yellow) will create a lush and inviting effect. Keep in mind that not all flowers will be readily available during the fall, so if you have your heart set on a type of flower that is out of season, be prepared to shell out a little more money to get what you want. Your wedding florist will be able to help you find the best flowers to match your style and budget. 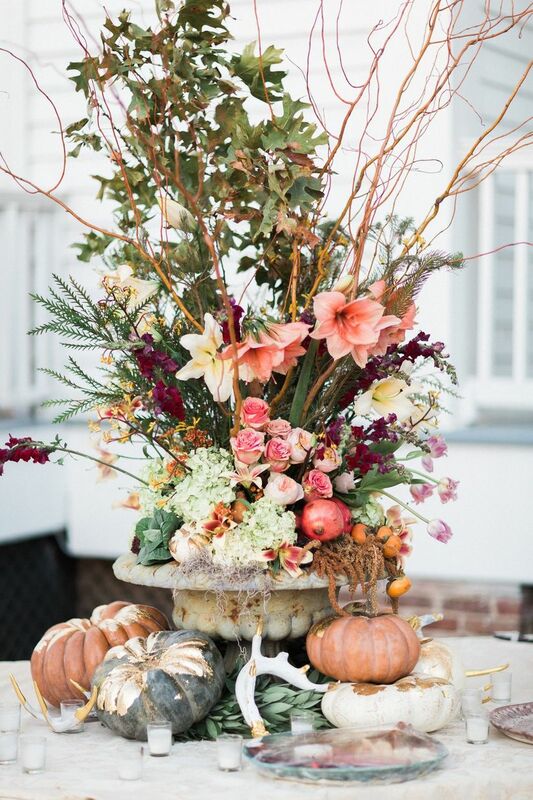 Some of our favorite fall wedding flowers included dahlias, sunflowers, roses, chrysanthemums, and cymbidium orchids. While fresh greenery is a beautiful finishing touch to any floral arrangement, there are a few other options that work particularly well for fall weddings. Goldenrod, amaranthus, curly willow, feathers, berries, and even autumn leaves that have begun to change color are just a few you can choose from. 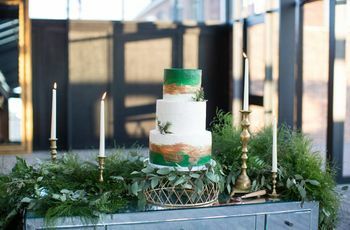 You can also incorporate unexpected objects into your reception centerpieces, such as dried moss, miniature pumpkins and deer antlers (faux versions can easily be found at craft and home decorating stores). Fall is inherently rustic (hayrides, pumpkin patches, corn mazes, you get the drift! 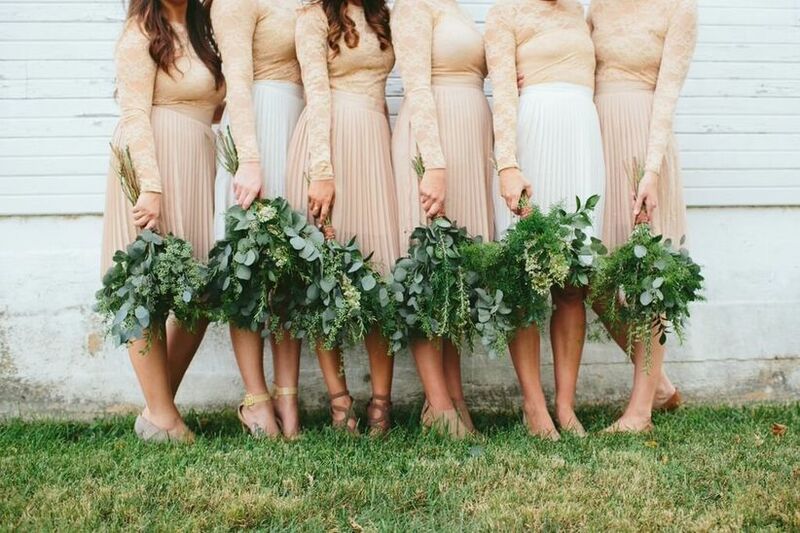 ), so it’s no surprise that rustic wedding attire is a popular choice for this season. This laid-back dress code is a natural fit for couples getting hitched at a barn or farm. If you're a bride who's wearing a wedding dress, look for styles with slimmer, flowy silhouettes and lightweight fabrics. 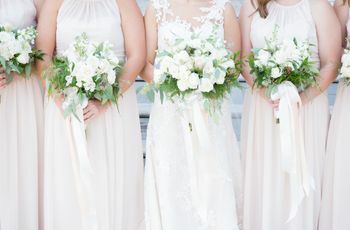 You won't want to be wearing a heavy ball gown or skintight dress if you're going to be spending a good part of the day walking around outdoors (and possibly getting stains on your wedding gown). Rustic wedding attire for grooms runs the gamut from tweed suits and bow ties to vests with denim pants and cowboy boots. Always choose your attire based on the style of your venue—this rule goes for wedding guest attire, too. What you'd wear to a wedding at a formal country club should be different than what you would wear at an off-the-grid location in the mountains. Depending on your wedding date and location, fall temperatures can get pretty chilly, and sometimes they're downright freezing. This is a fun opportunity to experiment with accessories to keep everyone warm and stylish. Brides, you can throw on a flannel top while you get ready with your #bridesquad, or surprise them with matching plaid tops to wear for a cute wedding day photo op. For more traditional dress codes, we like cashmere pashminas and faux fur wraps. If you can't decide what to give your guests as wedding favors, why not go with something practical? 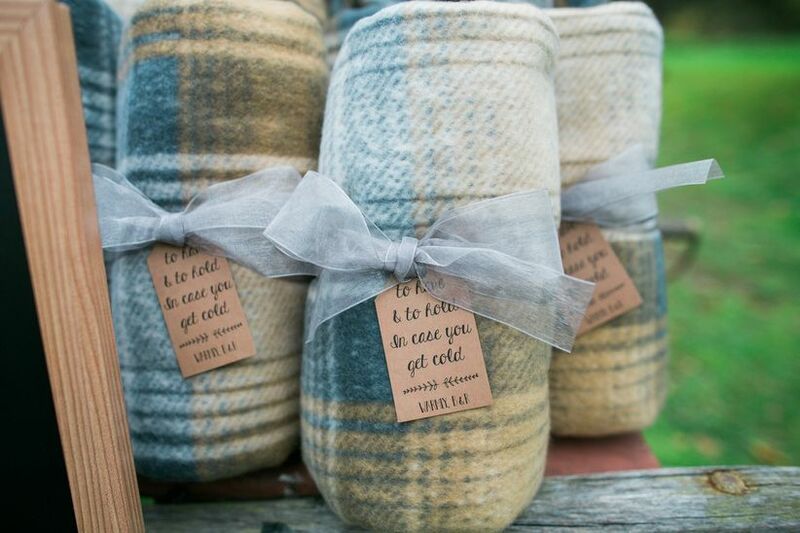 Cozy wool blankets will keep guests warm at an outdoor fall wedding and can be reused again and again after the wedding day is over. While we’ll never say no to wedding cake, we have to admit that fall weddings are a great opportunity to surprise your guests with seasonal desserts. Yes, we’re talking pies. Apple, pumpkin, cherry... the list goes on! 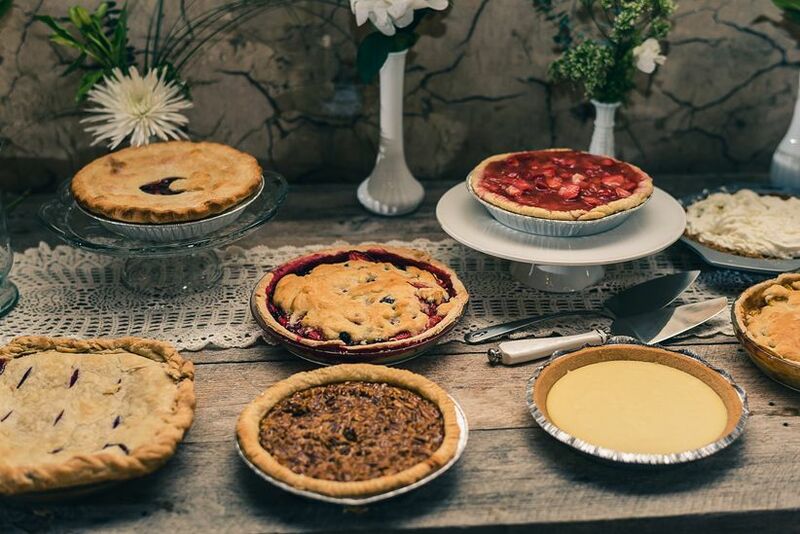 You can serve a variety of pies in lieu of a traditional cake, or treat your guests to miniature pies as take-home favors. If you don’t like pie (or if you simply want to serve all the desserts), then caramel apples, pumpkin rolls and apple cider donuts are a few other fall-themed options. Create a dessert display table so your guests can see all of their options. Finally, don’t forget about your beverages. Keep your guests warm with a hot cocoa or apple cider station. You can even serve spiked versions for the 21 and older crowd. Check out the video below for a tasty fall signature cocktail!